This project was winner of the one week student project competition at the BCBT 2012 summer school. Three conditions were used: Seeing, Blindfolded and Blindfolded+Auditory Feedback. Auditory feedback was given through speakers in the room. Deviation from ideal line was calculated online using processing and euclidian distance. The pitch of the sound was modulated linearly to the distance to the ideal line. A threshold of 10cm arround the ideal line was used without sound. As predicted, subjects performed best in the seeing condition with an absolute mean error over the last 10 samples of 5.3cm. The auditory feedback condition was second best with mean of 16.9cm and the blind condition was worst with absolute mean error of 17.8cm. An repeated measure anova reported a significant effect of condition on absolute error with p = 0.0119 (F= 5.25). Posthoc t-tests showed an significant difference of vision vs blind (p = 0.014), an significant difference between vision and audio (p = 0.014), but no difference between blind and audio (p =0.93). 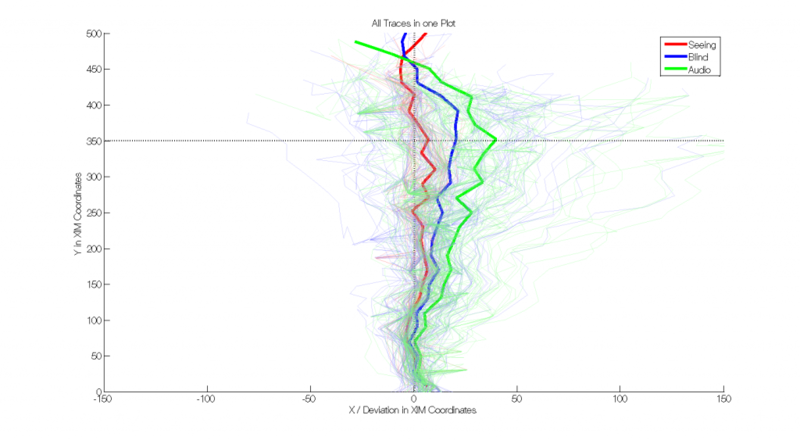 We deliver a basis of the order of magnitude of deviation of blind walking on a straight line. We tried to alter the performance by additionally adding auditory feedback, which did not change the performance compared to the blind condition. 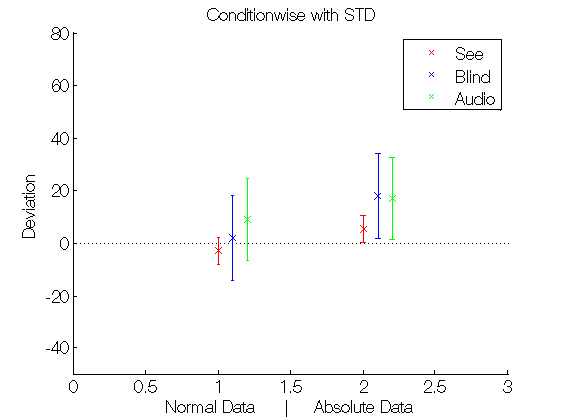 The difference in Figure 1 of audio to blind is the relative difference, subjects seemed to get a rightward bias due to the auditory feedback.